As debate moderators introduce every other candidate by their political credentials (Governor, Senator, what have you), Donald Trump comes to us only as “businessman.” So considering it’s his one and only qualification for the candidacy, you’d think he’d be better at it. Trump’s purported lack of business acumen has been a major sticking point recently, with Marco Rubio (may he rest in peace) even calling Trump out for his shoddy record: “I mean this is a guy that’s taken Trump airlines bankrupt, Trump vodka, nobody wanted it, Trump mortgage, was a disaster, Trump university was a fraud.” Rubio’s right—but he’s also barely scratched the surface. Of course, everyone is familiar with Trump’s real estate failings (more generally known as Atlantic City), but it’s the business ventures where his recklessness really shines. The man licensed his name to hundreds of trademarks (like the game show below that lasted but a year) and incorporated countless businesses-to-be, but only a select few (dozen) were actually led by the hand of the Donald himself. So to commemorate our country’s imminent President Trump-wrought downfall, we’ve compiled every major, non-real estate-related Trump business disaster out there (we think). Because while we aim for completeness, the man has failed—a lot. If you know of anything we missed, please do let us know down below. And Donald, good luck with that wall. 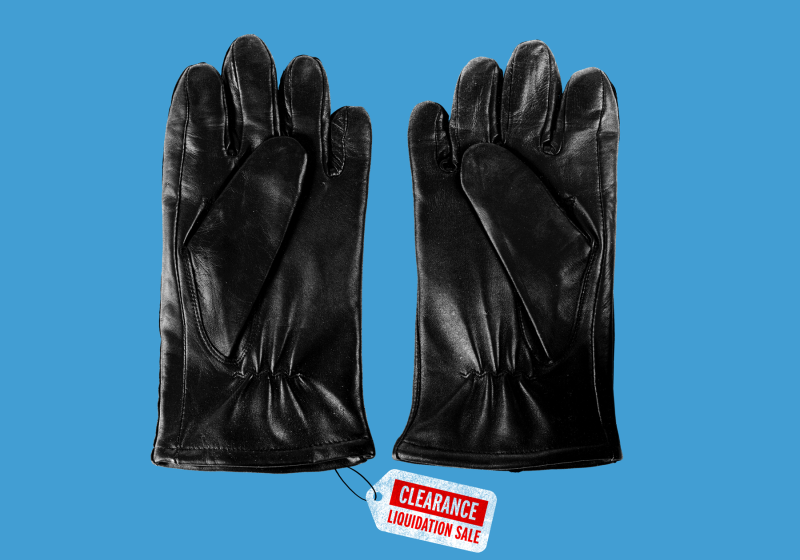 [Sharper Image CEO Jerry] Levin described the licensing agreement as “unique,” noting that it lacked the kinds of things he had seen in traditional agreements, like minimums, which would have required the Sharper Image to pay the Trump Organization a set amount regardless of how many steaks they sold. 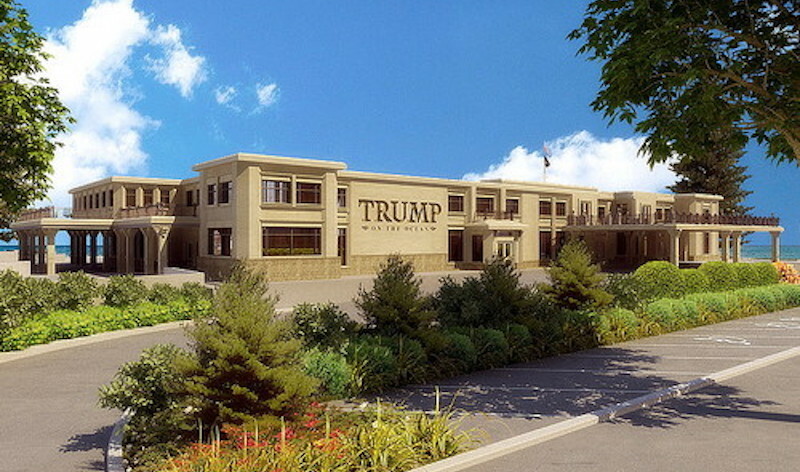 As you would expect of anything worthy of bearing the Trump name, the steaks didn’t come cheap. For instance, $1,000 would buy you 24 burgers, 16 steaks, and the dull pangs of regret. What went wrong: Remember Orbitz? Expedia? What about Travelocity? 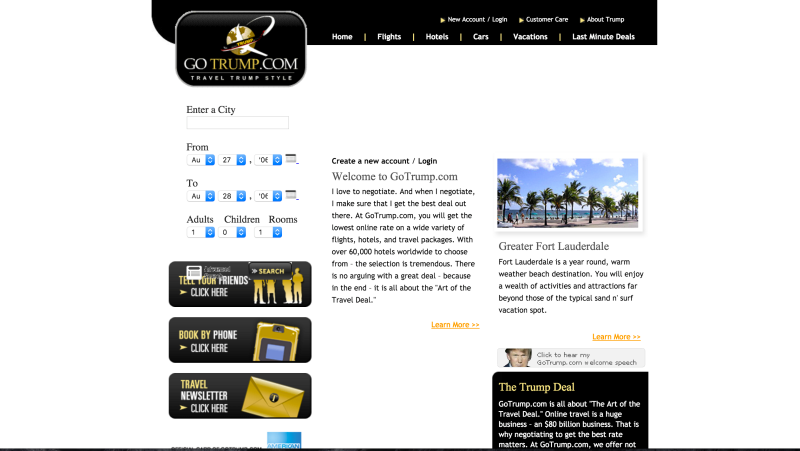 GoTrump.com provided exactly the same service but with significantly more Trump (i.e. pictures of his face, a delightful mustard-gold trim, and “Trump Picks,” which highlighted “specific hotels and vacation packages that are his personal favorites”). As Trump explained in the website’s About section, “I only put my name on the best, and at GoTrump.com you will get the best information and the best online rate available.” Unfortunately for the Donald, “the best” doesn’t really mean much of anything when you’re boasting both private jets and cheap hotel deals. When the site launched, a financial analyst told The Washington Post that it seemed like “a vanity site” that “won’t make much money.” He was right. The site shut down the following year. Service rendered: Hourly flights between Boston, New York City, and Washington D.C.
What went wrong: This was another case of Donald Trump attempting to turn a service that already exists into something a little more Trump-y. 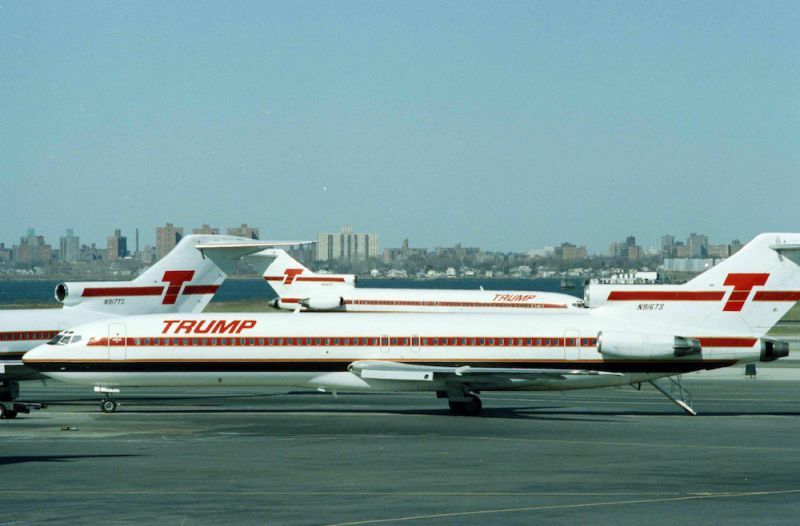 But this time, rather than build something entirely new, Trump purchased Eastern Air Lines Shuttle, which had been offering hourly flights on the East Coast since 1961 with moderate success. That all changed with Trump’s magic touch. 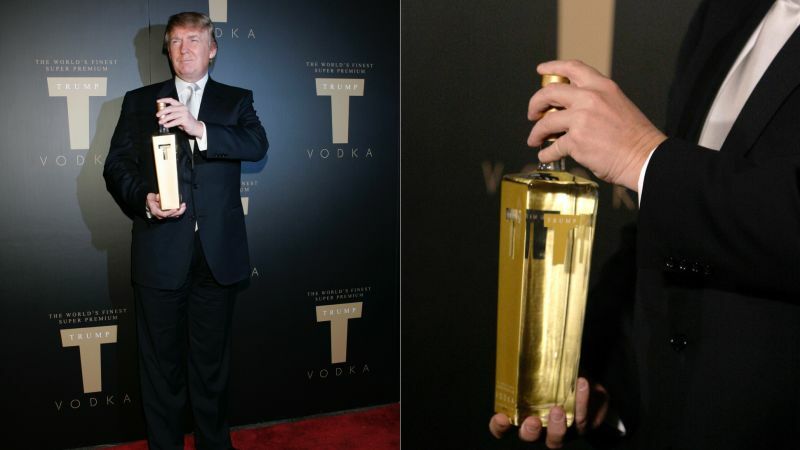 What went wrong: After labeling the drink as “The World’s Finest Super Premium Vodka” and proudly quintuple-distilling it in Holland from “select European wheat,” Trump was proudly telling anyone who’d listen that T&Ts (Trump and tonic) were about to become the number one drink in the country. 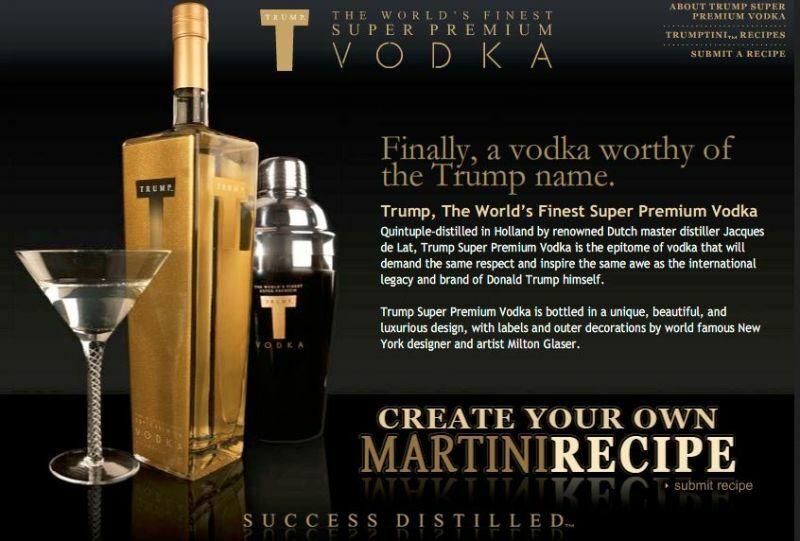 Trump was supposedly attempting to rival Grey Goose for a spot on the nation’s top shelves. No one else seemed to have gotten that message, though, and the drink went out of production in 2011 when no one ever wanted to drink it. 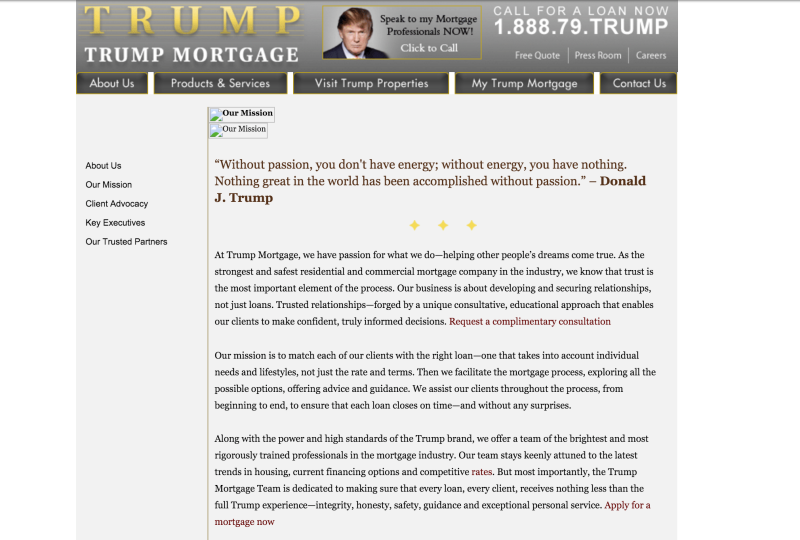 A year and a half later, after failing to hit any of its financial targets, Trump apparently decided he saw it, and Trump Mortgage shut down for good. Although if you ask him about it now, Trump calls the business a “tiny deal” that “he never ultimately moved forward with”—which is objectively untrue. Trump did move forward with the company, it’s just that no one wanted to follow. 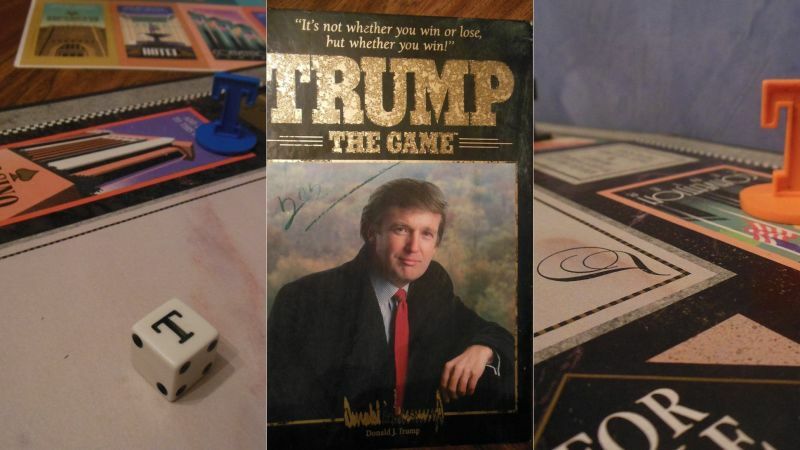 What went wrong: In 1989, Donald Trump decided that if people love Monopoly, surely they’ll love what is essentially the same thing but Trump-themed. He convinced Milton Bradley to release the game, assuring them that this face could move 2 million units off shelves in a year. His face, of course, could not, and the game went out of production after a year. But for the Trump purists among us, you can still buy a (lightly used version of) the game for an appropriate $69 on Amazon. What went wrong: The magazine launched in late 2007—just after his mortgage company was forced to shut its doors. Most people might see a failing market and a just-failed business venture as a sign that maybe it’s not a great time to start a print publication dependent on a general interest in luxury goods. Donald Trump, however, is not most people. While the magazine “saw early success, cashing in on the booming advertising market for yachts and other high-end commodities” (at least according to the closing press release), in actuality, it... did not. As it turns out, people suffering from a major recession aren’t too keen on “yachts” or “high-end commodities” or “anything that requires money.” Who knew. 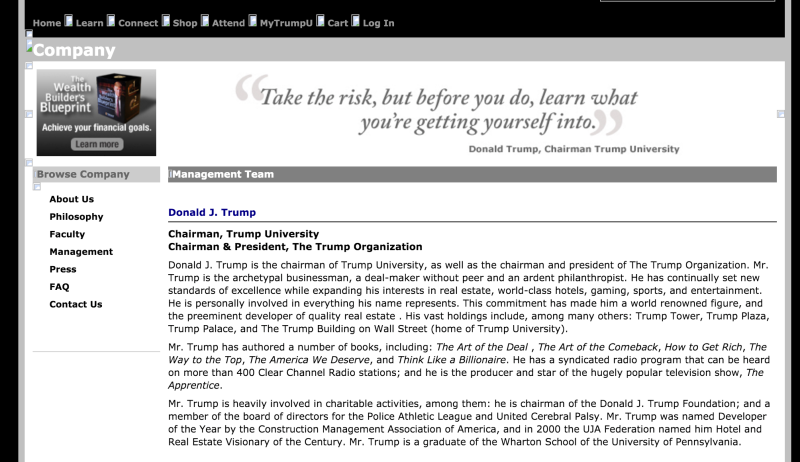 Once the lawsuit hit, state education officials started hammering the school for operating under the name “university,” since it was never chartered as such and was operating as an “illegal educational institution.” So that same year, Trump changed the name to the Trump Entrepreneur Initiative. Already outed as a fraud, though, the business shut down a year later. What went wrong: In 2004, Donald Trump decided that people were crazy about the water available in his hotels and casinos, announcing that “it was so good that people wanted to buy cases of it.” Attempts to distribute widely failed, and the water is once again relegated to Trump’s own properties. What went wrong: Since Trump couldn’t buy an NFL team of his own, he settled on the next best thing—the short-lived United States Football League established to challenge the NFL. Realizing he had a million other projects on his plate, though, Trump quickly sold the team only to buy them back again in the very same year. 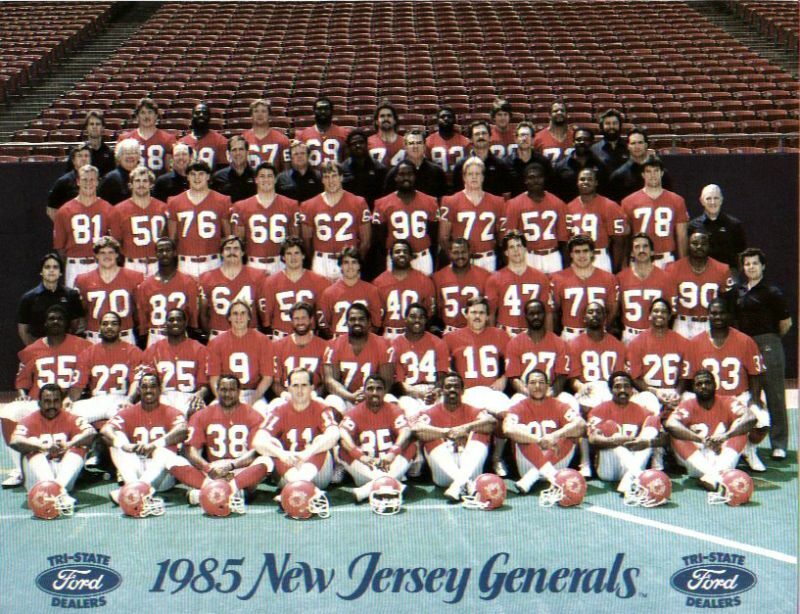 Talking about the ordeal now, Trump notes that he “did something I rarely do with the USFL. 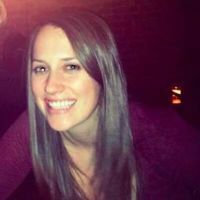 I went into something that was not good.” As rare as every single endeavor on this list. 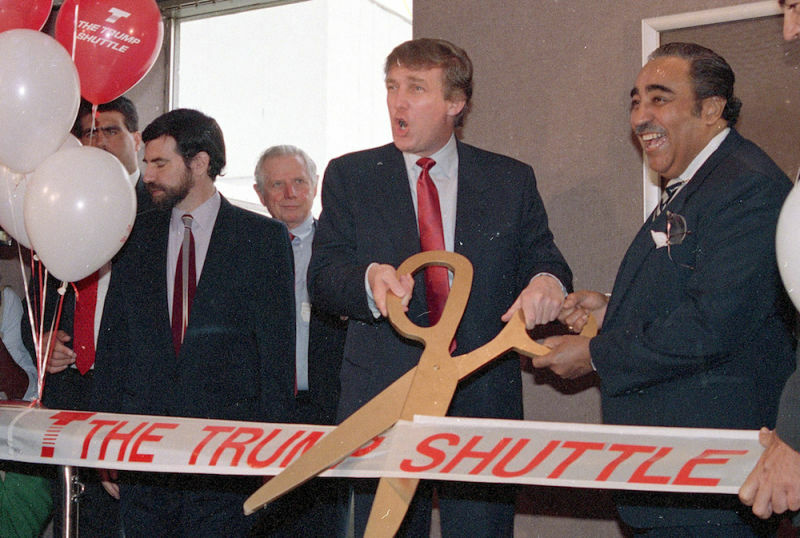 The first year, which sent riders from Albany to Atlantic City, actually managed to bring in some bag names, but unfortunately for Donald Trump, he just didn’t have the money to keep his name attached. Two years after starting the circuit, he was forced to sell his race to the DuPont Corporation, which then changed the name and removed every last trace of Trump. What went wrong: Located on the boardwalk in Jones Beach, Long Island, the gargantuan dining space totaled 80,000-square-feet with a 14,000-square-foot basement, all of which we’re sure looked great for the four months before Hurricane Sandy hit. According to Eater, the state had actually shot down Trump’s proposal four separate times since 2006. Once the hurricane took down Trump, though, he agreed to kill his plan—much to the delight of the surrounding community who never wanted it there in the first place. 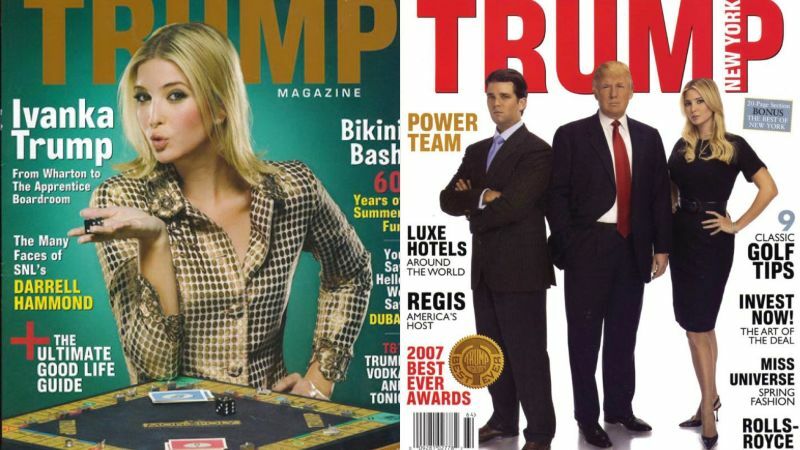 What went wrong: Since the folding of Trump Magazine proved that people clearly didn’t have money to spare after the bubble burst, Trump decided to change strategies. 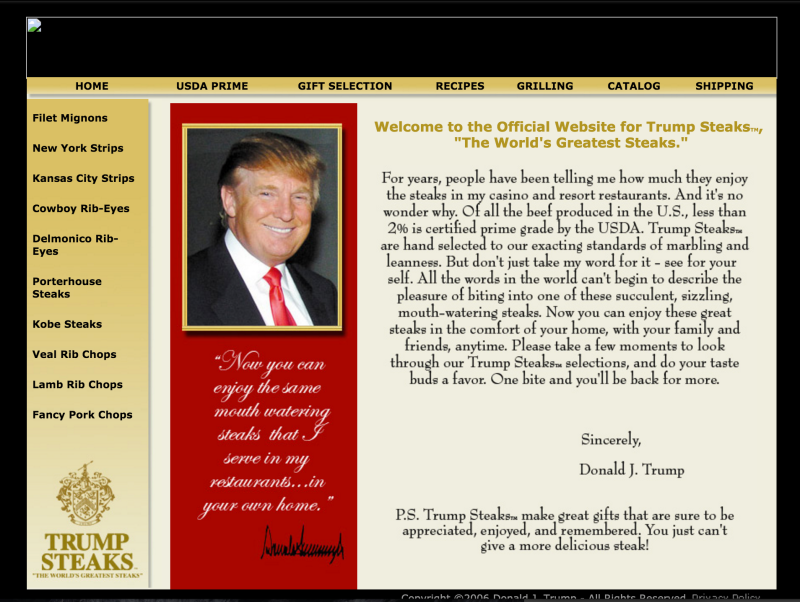 With the Trump Network, Trump offered a get-rich-quick scheme centered around what else but nutritional supplements. The motto: Discover the Difference between Opportunity and Success. And that’s what Donald Trump decided would be a great investment. Buzzfeed recently tried to secure audio of the Trump’s hours of archived programs but couldn’t nail anything down but the demo. So we may never know exactly what Trump decided to share with the masses (since absolutely no one ever tuned in), but judging by segment descriptions such as “No More Viagra for Rapists” and “Stay out of the tabloids and, for goodness sake, don’t say hello to those little boys” (referring to Michael Jackson), it sounds like his stump speeches are the next best thing. And sure, Trump could have gone with something vaguely within his realm of expertise—but why break with tradition? A local announcement at the time wrote that “Trump admits he’s hardly the man to head a new media firm. ‘I’ll tell you what I know about it: Absolutely nothing.’” He partnered with Freelinq Communications to launch the firm, but after getting shut out by his more competent competition, the endeavor failed to ever take off.